Revology, an Orlando-based manufacturer of classic Mustangs, just debuted its new reproduction 600 horsepower Shelby GT500 at the Specialty Equipment Manufacturers Association in Las Vegas. And though the car is far from cheap, it takes good looks from the ’67 pony, and melds them with modern components. And that’s just cool. I’m not sure what I think about replicas. On one hand, there’s something sacred about an original car, but on the other, we can’t forget that, in many ways, old cars sucked to drive. They were inefficient, unsafe, slow, and they handled like garbage. 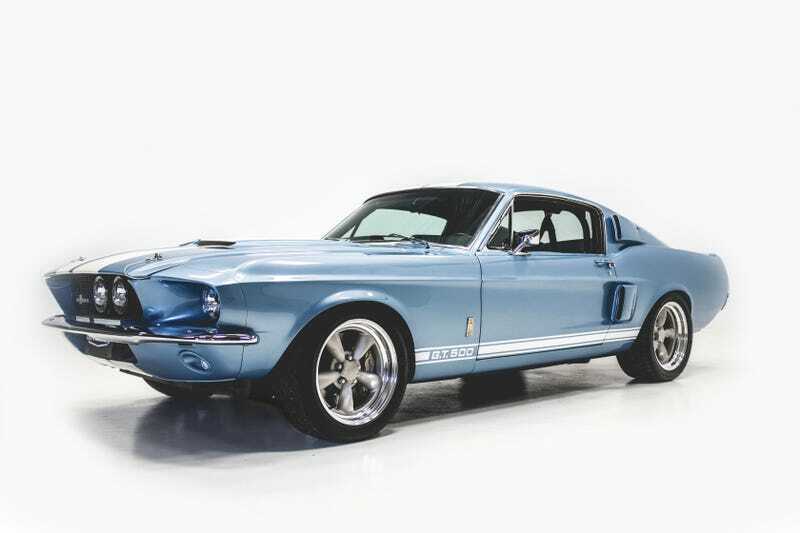 So I guess I see the appeal of Revology’s new $219,000 1967 Shelby GT500 reproduction. Not only is the body brand new, but the suspension, engine, steering, and brakes have been brought into the modern era. Tuned by Roush, the supercharged and intercooled 5.0-liter Coyote engine makes 600 horsepower and 475 lb-ft of torque, which gets sent through either a T56 six-speed manual or a Ford 6R80 automatic, and then into an Eaton limited slip differential-equipped Ford nine-inch rear end. Standard equipment includes air conditioning, power four-wheel disc brakes with 330mm slotted and ventilated rotors, six-piston calipers in front and four-piston in the rear, power rack and pinion steering, power windows and door locks, remote keyless entry, remote trunk release, intermittent wipers, tilt column, Bluetooth, leather seating, three-point seat belts, and a rolling code encrypted ignition system. Licensed by both Ford and Shelby, Revology also builds a $190,000 1966 Shelby GT350 model, which makes 450 horsepower from its naturally aspirated Coyote V8. Compared to that car, the new GT500 has a modified driveline, and changes to the suspension, cooling system, electrical system, and even the body (to handle the extra grunt). The cars come with a “1-2-5" warranty, which means a one year “bumper to bumper” warranty, a two year powertrain warranty (which covers the engine, trans, and rear axle), and a five year corrosion warranty for the body panels. So that’s cool. But is this GT500 really worth that price tag when you could probably snag a modern Mustang with much more power and an original GT500 for less? Who knows; that’s between you and your car god.